Chrichton's World: Review A View to a Kill (1985): Roger Moore's final Bond is a favourite of mine! 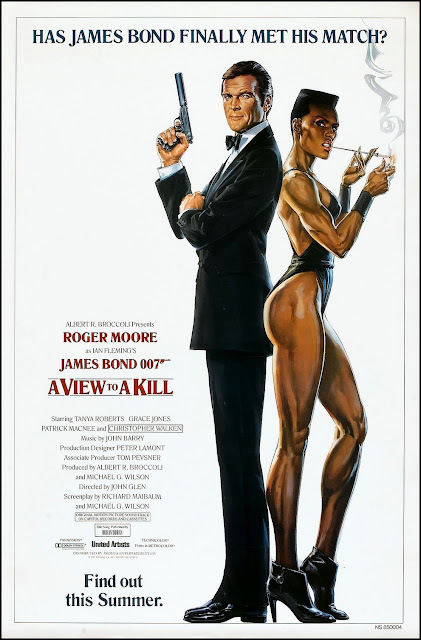 Review A View to a Kill (1985): Roger Moore's final Bond is a favourite of mine! It's an old movie so at this point I am going to assume you are familiar with the story and therefore I will venture a little into spoiler territory. Not that there is that much to spoil since the story is pretty straightforward. Roger Moore's final Bond is a favourite of mine. And to be honest I don't know what exactly the reasons are. Somehow this Bond film resonates with me. Perhaps it's Eighties nostalgia. But I will try to explain by addressing the things I liked. First and foremost it's the theme song. Duran Duran rocked it if you ask me. It has that typical electro pop sound mixed with the classical Bond theme. How can you go wrong with that? But also their video clip was fun since it blended scenes of the film with their own little story very nicely. Back then you got bombarded by the song since it was on the radio and television all the time. And each time you saw and heard the song it made you psyched about the film. It still does. I just love the song which is played in many different versions throughout the film. Then there is the action. As always it's entertaining and exciting. Maybe not entirely well choreographed as you might be used to since it's obvious that Roger Moore is too old to convince as an action hero. However Moore does add charm and brings humour to the action scenes that will definitely make you laugh. Before I never considered Zorin to be a good villain however I have now come to the realization that he just might be one of the best in the franchise. Previous Bond villains were certainly deadly and relentless but they often had some redeemable qualities about them. Walken's Zorin has none. All he cares about is himself and his plans. He is called a psychopath but to what extent you don't get to know until much later. I won't go into details but the ruthlessness displayed is chilling. It's also the moment another character realizes she has been wrong all this time. I am of course talking about Grace Jones' character May Day. Up until this point she had been very cold blooded and lethal. But then we get to see a compassionate side to her. Without hesitation or doubt she decides to help out the best she can. She started out as a relentless villain but ends up a badass hero. I love that kind of thing since it's a simple but very effective plot element. You will instantly forgive her for the bad deeds she has committed prior to this moment especially since May Day is able to convey her pain and anger very convincingly. A View to a Kill ends with how most Bond films end where James is being naughty with Bond girl Tanya Roberts. This James Bond film certainly is heavily flawed but it's also a lot of fun and keeps remaining to be fun after all these years. In the end that is what matters the most right?